The sitter's daughter, Mary Sidney Ashe Gadsden [Mrs. Christopher Gadsden, c. 1792-1855], Edisto River and Charleston, South Carolina; her granddaughter, Jane Elizabeth Gadsden Doar [Mrs. Stephen Decatur Doar]; probably her sister, Harriett Ann Gadsden Doar [Mrs. David Doar, 1845-1879]; her husband, David Doar [1850-1928]; their son, Thomas Screven Doar [1878-1951]; sold in 1922 by Charlotte Cordes Doar Shore [Mrs. George shore, 1867-1948], Sumter, South Carolina, to (Frank W. Bayley, Copley Gallery, Boston); consigned March 1923 to (M. Knoedler & Co., New York); purchased 26 March 1923 by Thomas B. Clarke [1848-1931], New York; his estate; sold as part of the Clarke collection on 29 January 1936, through (M. Knoedler & Co., New York), to The A.W. Mellon Educational and Charitable Trust, Pittsburgh; gift 1942 to NGA 1942. Lawrence Park, Gilbert Stuart: An Illustrated Descriptive List of his Works, with an Account of his Life by John Hill Morgan and an Appreciation by Royal Cortissoz, New York, 1926, 114. Thomas Screven Doar, Jr., of Sumter, South Carolina, recalled in a telephone interview 19 May 1989 that his father owned the painting. A letter from Frank Bayley, dated 31 August 1922, to Charlotte Shore, Sumter, South Carolina, discusses the sale (copy, Catalog of American Portraits, National Portrait Gallery, Washington, D.C.). George D. Shore, Jr., of Sumter, South Carolina, has suggested that his mother acted in the sale as a representative for her cousin Thomas Screven Doar (letter from George D. Shore, Jr., 21 April 1961, NGA curatorial file). The name of the seller and the date of purchase are recorded in a copy of Portraits by Early American Painters of the Seventeenth, Eighteenth and Nineteenth Centuries Collected by Thomas B. Clarke (Exh. cat., Philadelphia Museum of Art, 1928) annotated with information from files of M. Knoedler & Co., NY (copy in NGA curatorial records and in NGA library).Information was also provided by Melissa De Medeiros, librarian, M. Knoedler & Co., 29 April 1989 (letter, NGA curatorial file). Exhibition of Portraits by Early American Portrait Painters, The Union League Club, New York, February 1924, no. 15, as John Baptista Ashe by Gilbert Stuart. Portraits by Early American Artists of the Seventeenth, Eighteenth and Nineteenth Centuries, Collected by Thomas B. Clarke, Philadelphia Museum of Art, 1928-1931, unnumbered and unpaginated catalogue, John Baptista Ashe by Gilbert Stuart. American Paintings, National Gallery of Art, Washington, D.C., 1943. Gilbert Stuart: Portraits Lent by the National Gallery of Art, Washington, D.C., Virginia Museum of Fine Arts, Richmond, 1944-1945, no. 14. American Paintings from the Collection of the National Gallery of Art, Washington, D.C., 1947. American Paintings from the Collection of the National Gallery of Art, Washington, D.C., 1948. American Paintings from the Collection of the National Gallery of Art, Washington, D.C., 1949. Exhibition of Early American Portraits on Loan from the National Gallery of Art, Washington, D.C., Pack Memorial Public Library, Asheville, North Carolina, 1949, no. 5, as John Baptista Ashe. American Paintings from the Collection of the National Gallery of Art, Washington, D.C., 1950. American Paintings from the Collection of the National Gallery of Art, Washington, D.C., 1951. American Paintings from the Collection of the National Gallery of Art, Washington, D.C., 1953. American Paintings from the Collection of the National Gallery of Art, Washington, D.C., 1955. American Paintings from the Collection of the National Gallery of Art, Washington, D.C., 1956. Extended loan for use by Blair House, Washington, D.C., 1964-1984. Extended loan for use by Ambassador Ronald Lauder, U.S. Embassy residence, Vienna, Austria, 1986-1990. Park 1926, 113-114, no. 34, repro. Portraits by Early American Artists of the Seventeenth, Eighteenth and Nineteenth Centuries, Collected by Thomas B. Clarke. Exh. cat. 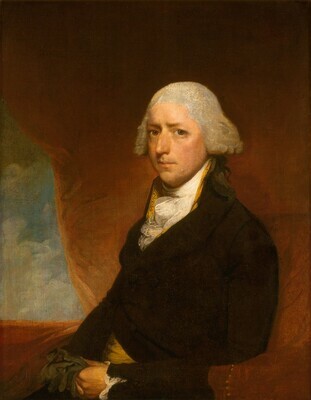 Philadelphia Museum of Art, 1928, unnumbered, as John Baptista Ashe by Gilbert Stuart. MacMillan, Henry Jay. "Gilbert Stuart's Portrait of an Ashe." Lower Cape Fear Historical Society Inc. Bulletin 8 (October 1964): 6, repro. American Paintings and Sculpture: An Illustrated Catalogue. National Gallery of Art, Washington, 1970: 102, repro. American Paintings: An Illustrated Catalogue. National Gallery of Art, Washington, 1980: 228, repro. American Paintings: An Illustrated Catalogue. National Gallery of Art, Washington, 1992: 351, repro. Miles, Ellen G. American Paintings of the Eighteenth Century. The Collections of the National Gallery of Art Systematic Catalogue. Washington, D.C., 1995: 282-284, repro. 283.